A DOG believed injured is missing after a car crash in Scarborough. 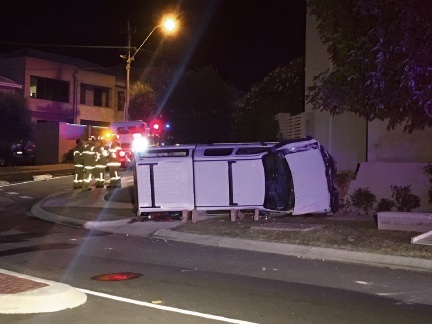 Traffic police are investigating multiple car crashes in the suburb on Wednesday night. They believe a driver suffering from a medical episode crashed his white Toyota Hilux into a wall then power pole near the intersection of Moorland and Duke streets at about 7pm. The vehicle rolled, landing on its side and the drive was trapped by his arm. Five men tried to rock the car to enable the drive to free himself. A dog in the car, which appeared injured, escaped after the door was opened. Stirling rangers are searching for the dog, which is described as a male two-year-old black and tan terrier cross cavoodle and it is microchipped. Traffic police believe the vehicle was involved in four other minor crashes before the incident, one of which resulted in a woman and her eight-year-old daughter being taken to hospital with minor injuries. They are also following up on reports that the same car was involved in a collision with a power pole on Karrinyup Road.